Inside the walls of hospitals across the country, babies are literally crying out for drugs. The rising rate of opioid use and abuse has dramatically increased the number of infants born with neonatal abstinence syndrome (NAS). Characterized by inconsolable crying, seizures, difficulties feeding, sweating, and vomiting, NAS is the result of an infant’s withdrawal from opioids that the child was exposed to in utero [1, 2]. Upon delivery, newborns diagnosed with NAS often require prolonged treatment and spend days, weeks, or even months in a hospital. Figures published in a 2016 report by the Center for Disease Control and Prevention (CDC) concluded that the rate at which infants born with NAS due to prenatal exposure to prescription painkillers or heroin had quadrupled over a fifteen-year period in the U.S . The states of Maine, Vermont, and West Virginia have the highest rates of infants born with NAS, exceeding 30 cases per 1,000 births . As alarming as this is, the rising number of incidents show no signs of decreasing [3, 4], and the prognosis of infants exposed to opioids remains poor. Consequently, these children experience a variety of complications affecting their young lives such as a range in severity of NAS symptoms, altered methods of feeding, and potentially adverse short- and long-term developmental outcomes. Image Attribution: "Dramatic Increase in Maternal Opioid Use and Neonatal Abstinence Syndrome" by the NIDA (NIH) is in the Public Domain. NAS was observed as early as 1875 and was reported as Congenital Morphism. At the time, there was no treatment. With no intervention available, these infants often died. In some cases, mortality was not exclusive to the absence of treatment but was due to premature birth. By 1901, doctors had recognized that NAS was a direct consequence of interrupting in the placental supply of opioids. The placenta, which acts as the interface between mother and fetus, facilitates gas exchange, metabolic transfer, hormone secretion, and fetal protection. Drugs, including opioids, readily cross the placenta and pose severe health consequences for the fetus. Because opioids are low in molecular weight and are lipid soluble, they readily cross the placenta and reach maximal uptake by the fetus anywhere from two to three hours after their mother has taken the drug . Pharmacological – drug-based – interventions have improved infant survival rates significantly . In recent years, a wide range of drugs have been used to treat NAS, but evidence suggests that opioids are the most appropriate, at least in infants exposed to diamorphine or methadone . Most commonly used pharmacological-based interventions are performed in a neonatal intensive care unit (NICU), where the current standard of care is a methadone or morphine solution that is orally administered [6, 7]. In this process, infants are prescribed a dose of either morphine or methadone, weaned from it, and then discharged upon successful evaluation. A scoring system, known as the Finnegan Neonatal Abstinence Scoring System (FNASS), is used to evaluate NAS in the diagnosed infant [6, 7]. During this treatment plan, infants have little-to-no interaction with their mother depending on the severity of their symptoms and their mother’s level of opioid dependency. Confounding these protocols and evaluations, however, is that many infants with NAS have been exposed to other substances such as alcohol and amphetamines. Thus, further research is being conducted to determine the optimal protocol for these infants, which may include a single opiate or multiple drug regimen [1, 6, 7]. Emerging non-pharmacological treatments in use include approaches that utilize an eat, sleep and console (ESC) model to treat infants with varying degrees of NAS symptoms [6-8]. With this approach, newborns are provided increased access to their mother, more-so for mothers undergoing supervised opioid management treatment and not using street drugs. Recent research  has confirmed that breastfeeding is not a problem under these circumstances as evidence demonstrated that the level of medication in the mother’s breast milk is low enough to be safe for the infant. 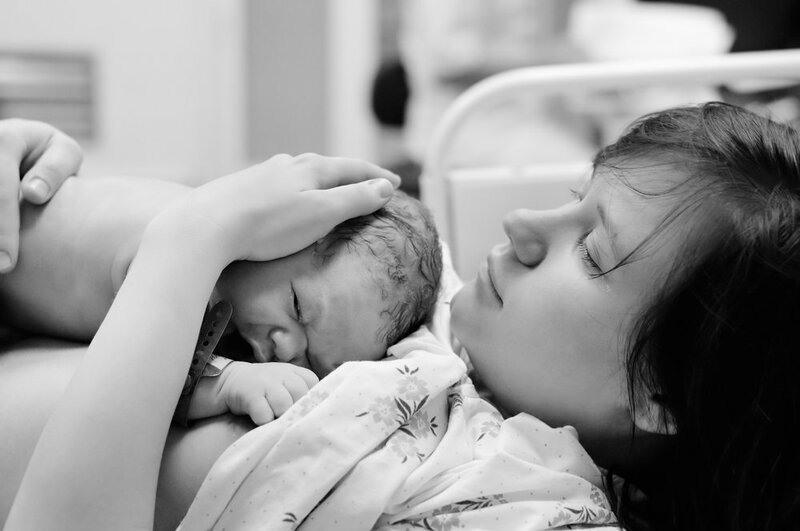 Scientists hypothesize that increased mother to child time during treatment is beneficial for both parties and may reduce overall treatment time for the infant . On-going research aims to find the balance between non-pharmacological and pharmacological methods for treating babies presenting with NAS. NAS exposes a very complex two-body problem between expecting mothers and their babies. As noted in recent statistics, prenatal opioid exposure may be a direct consequence of maternal opioid abuse or treatment for opioid dependence. With that said, it is essential to make a clear distinction between a baby born to a mother using street opioids during pregnancy from one born to a mother undergoing treatment for opioid dependency. Fetuses of mothers using opioids and receiving little to no prenatal care have an increased risk of having a preterm birth, intrauterine grown restriction, and an increasing incidence of fetal death [1, 6]. Treatment for opiate dependency during pregnancy is characterized by three conventional drugs: methadone, buprenorphine, and naltrexone. Among other side-effects, NAS has been noted as an outcome of both methadone and buprenorphine treatment during pregnancy . A series of animal and human studies have been performed to determine the efficacy of each . Animal studies using methadone demonstrated detrimental effects on growth, behavior, neuroanatomy, metabolism, and increased perinatal mortality . Clinical observations of buprenorphine concluded that its impact on infant development is similar to those of methadone, but also that it is potentially superior in reducing the incidence and prognosis of NAS . In most neonates, following maternal treatment with buprenorphine, NAS presented as mild and did not require pharmacological intervention . Although limited in sample size, results from naltrexone experiments suggest superior outcomes in neonates from mothers treated with oral or sustained-release implantable naltrexone compared to those treated with methadone or buprenorphine . While some of these drugs have adverse side-effects, they outweigh the detrimental effects of opioid abuse during pregnancy. On-going trials with methadone, buprenorphine, naltrexone, and other drugs aim to address opioid dependency along with best practices to maintain the health of both the mother and fetus. The cries of the babies affected by the opioid epidemic have been, and continue to be, heard across the nation. It is unclear, at this point how NAS will impact these children’s lives in the long term, but as awareness of NAS as a national epidemic grows, protocols can be put in place to standardize the assessment of patients and management of treatment. Success in reducing the frightening statistics of infants born needing therapy for NAS will require the combined effort of researchers, physicians, and policymakers to provide adequate education and treatment regimens for opioid-dependent women so that they and their children may lead full and healthy lives. Logan, B. A., Brown, M. S. & Hayes, M. J. Neonatal Abstinence Syndrome: Treatment and Pediatric Outcomes. Clinical obstetrics and gynecology 56, 186-192, doi:10.1097/GRF.0b013e31827feea4 (2013). Farid, W. O., Dunlop, S. A., Tait, R. J. & Hulse, G. K. The Effects of Maternally Administered Methadone, Buprenorphine and Naltrexone on Offspring: Review of Human and Animal Data. Current Neuropharmacology 6, 125-150, doi:10.2174/157015908784533842 (2008). Ko, J. Y. et al. Incidence of Neonatal Abstinence Syndrome - 28 States, 1999-2013. Center for Disease Control and Prevention, Morbidity and Mortality Weekly Report 65, 799-802 (2016). Brown, J. D., Doshi, P. A., Pauly, N. J. & Talbert, J. C. Rates of Neonatal Abstinence Syndrome Amid Efforts to Combat the Opioid Abuse Epidemic. JAMA pediatrics 170, 1110-1112, doi:10.1001/jamapediatrics.2016.2150 (2016). Griffiths, S. K. & Campbell, J. P. Placental structure, function and drug transfer. Continuing Education in Anaesthesia Critical Care & Pain 15, 84-89, doi:10.1093/bjaceaccp/mku013 (2015). Gomez-Pomar, E. & Finnegan, L. P. The Epidemic of Neonatal Abstinence Syndrome, Historical References of Its’ Origins, Assessment, and Management. Frontiers in Pediatrics 6, doi:10.3389/fped.2018.00033 (2018). Johnson, K., Gerada, C. & Greenough, A. Treatment of neonatal abstinence syndrome. Archives of Disease in Childhood - Fetal and Neonatal Edition 88, F2 (2003). Grossman, M. R., Lipshaw, M. J., Osborn, R. R. & Berkwitt, A. K. A Novel Approach to Assessing Infants With Neonatal Abstinence Syndrome. Hosp Pediatr 8, 1-6, doi:10.1542/hpeds.2017-0128 (2018). Hudak, M. L. & Tan, R. C. Neonatal drug withdrawal. Pediatrics 129, e540-560, doi:10.1542/peds.2011-3212 (2012).